New York Welding Supply Co. began on Beekman St. around 1925, moved to Grand St. in 1928, and was located in this building on the northeast corner of Grand St. and Wooster St. from 1942 through 1960. The proprietor of New York Welding Supply was William Frank Dusenbury (1890-?). Dusenbury registered for the World War II draft in 1942 when he said that he was born 11 July 1890 in New York City, and that he was employed at New York Welding Supply Co., Inc., 38 Wooster St., New York. (38 Wooster St. was the address of the building above on its Wooster St. side.) He lived for many years in Hillsdale, Bergen County, New Jersey, and appeared in the 1930 and 1940 U. S. Census reports at that address. Earlier Dusenbury lived with his father, a farmer, in Wappinger Falls, NY. His 1917 World War I draft registration identified him as a farm laborer, age 26, working for William F. Dusenbury, Sr., in Wappinger Falls. In the 1920 U. S. Census Dusenbury still lived with his father in Wappinger Falls, but gave his occupation as "welder, Navy Yard." 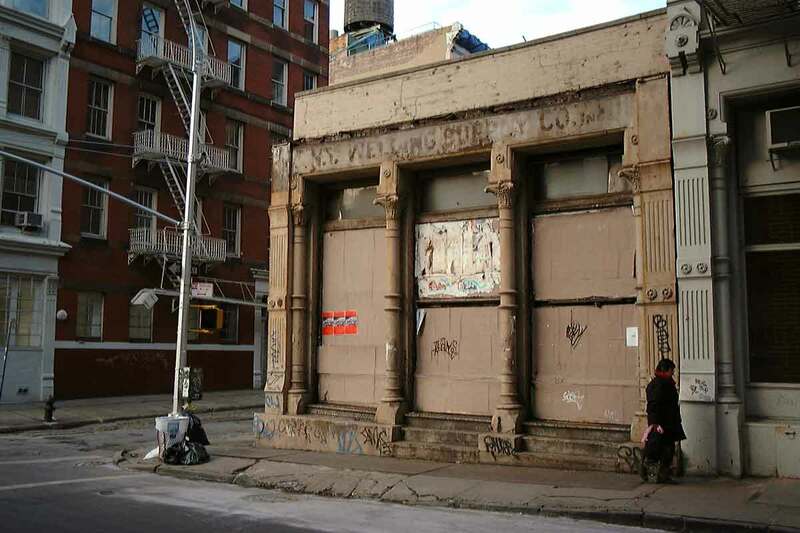 New York Welding Supply left their Grand St. location in 1961. From 1961 through 1974 they were listed in the New York telephone directory at 133 Leroy St. in Greenwich Village and at 310 Whitier St. in the Bronx. As of February 2015 Google Maps was showing a Bronx Welding Supply at 310 Whitier St. (successors?). The building at 72 Grand St. was demolished in the early 2000s. In 2004 excavation and construction work on the site damaged the building next door at 74 Grand St. 74 Grand St. was a landmarked five-story cast iron building designed by George Da Cunha. In 2009 74 Grand St. had to be taken down, and its cast iron facade stored for possible future re-assembly (www.citylandnyc.org).